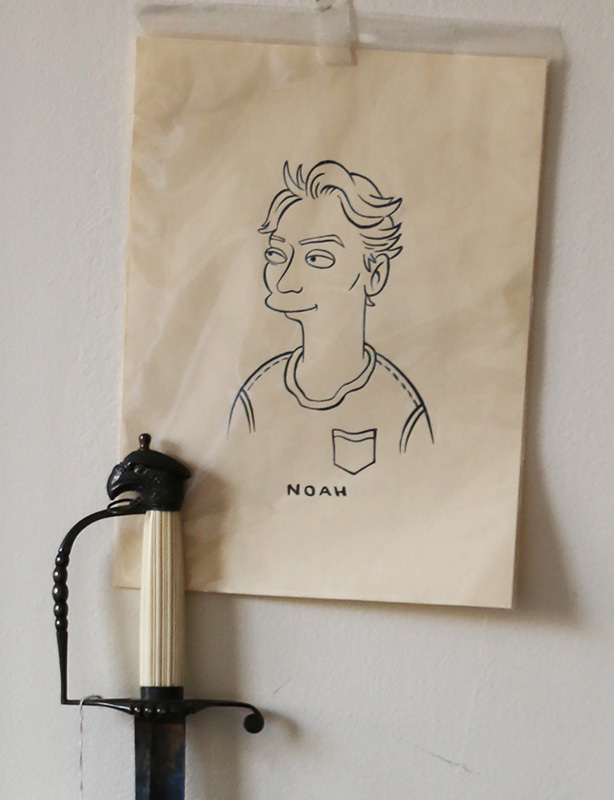 As a kid, Noah Wunsch played with blown-glass staffs and dueled his older brother, Eric, with antique swords (safely corked), and while he’s more peaceable these days, in his high-ceilinged apartment overlooking Gramercy Park, he still surrounds himself with fine things. Collecting is a serious business for the Wunsch family, which oversees the Wunsch Americana Foundation, a lender and giver of early American decorative arts objects to institutions across the country, but in Noah's private life one rule guides his hand: “no matter what you're buying make sure you like it.“ In this episode of Curious Objects, Ben takes the measure of Noah’s treasure—which ranges from a 60 BC Visigothic belt buckle to the zany artwork of Genieve Figgis—and learns how the collection was built. Kyoto table by Shiro Kuramata, 1983. Except as noted, all photographs by Katherine Lanza. Benjamin Miller: Hello and welcome back to Curious Objects, brought to you by The Magazine ANTIQUES. I’m Ben Miller. If you’re a longtime listener, you’ve heard me talk with dealers and curators, scholars and auctioneers, craftsmen and connoisseurs. But one group we haven’t spent much time with is the people who make this whole industry work: collectors. These are the people who buy from dealers and from auctions, who donate to museums, who read books and articles. Some of them even listen to podcasts. 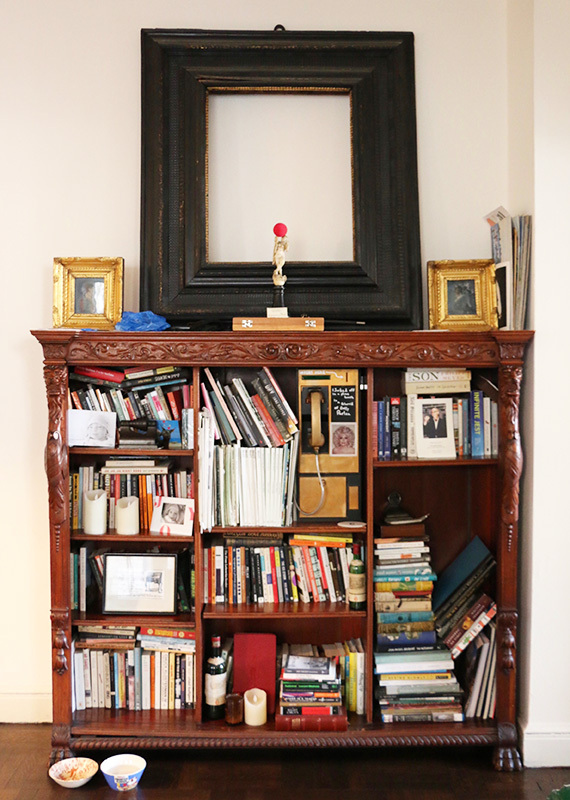 I sat down with Noah in his Manhattan apartment, which used to be a storeroom for the family collection. It’s filled it with all manner of curious objects, from ancient to modern and everything in between. If you’re like me, and are curious about what makes collectors tick, and how they think about whether and what to buy, I think you’ll enjoy this episode. And if you’d like to see pictures of all these objects, go to themagazineantiques.com/podcast, or visit my Instagram @objectiveinterest. Before we jump in, here’s a quick word from our sponsor. Have you ever wondered who was the Master of the Embroidered Foliage or wanted to know what it was like to be at Andy Warhol’s factory? 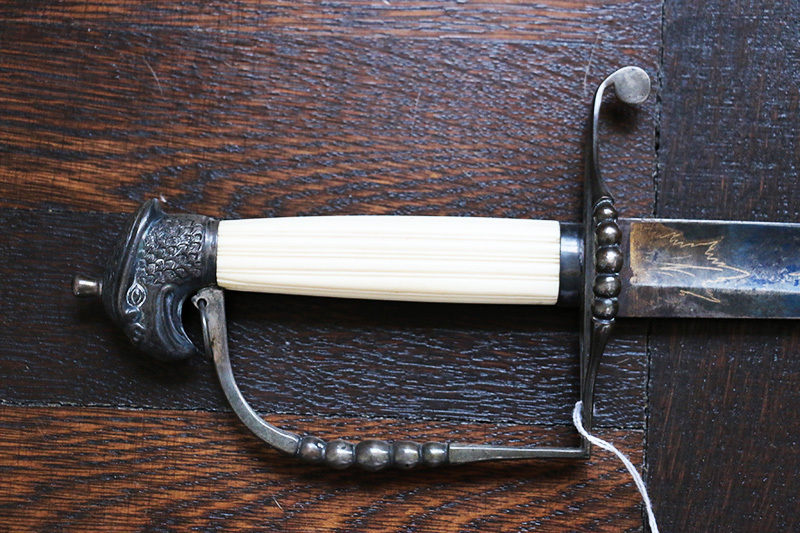 Freeman’s, America’s oldest auction house, tells the stories of these and other curious objects. Discover Pennsylvania’s craft legacy, go behind the scenes at auctions and exhibitions, and uncover your passion for collecting. Visit freemansauction.com to sign up for their newsletter, and get these stories and more delivered straight to your inbox. Ok. I want to start off by saying thank you very much for being on the podcast. And I want to know a little bit about the history of this foundation of which you are a third-generation member if I’m counting right. So what is the Wunsch Foundation and how did it get it started? Noah Wunsch: The Wunsch Americana Foundation is a nonprofit that’s focused on making sure that early American decorative arts and Americana as a field continues to progress. And that can mean any number of things and we hope that it does of course. I think the way that my brother and I are certainly inspired is by connecting a newer younger generation into the field as well. Finding narrative through-lines finding experiences that can help educate them and help them understand that anything dated, anything that was an antique or considered to be one was at one point the height of contemporary. Everything has its period of modernism and finding, narratively, the through-lines particularly through contemporary design that connects those dots. Benjamin Miller: And how has the mission of the foundation changed over time? Noah Wunsch: You know, it’s a funny thing. I didn’t get to talk too much about it with my grandfather when he was alive which is unfortunate. Benjamin Miller: And he got the ball rolling? Benjamin Miller: How long ago was that? Benjamin Miller: So he wasn’t born a collector. He became a collector. Benjamin Miller: I’ll deal with that later. Benjamin Miller: The spirit of perfectionism. Exactly. And so today the foundation has pieces that are on exhibit at museums around the country. What does the what does the medium to long term future of the foundation look like? What do you want to be doing in 10 or 20 years from now? Noah Wunsch: I think we want to continue on the path we’re going right now. Eric and I have been working on a commission series with contemporary designers where we work with them and we discuss our collection with them and usually in a collaborative process we decide on one piece for them to work with in the foundation and we ask them to create what is not a reinterpretation but something that’s inspired by the piece. And we found that again narratively that’s a really nice through-line and a nice way of telling a story of how these pieces were contemporary and why they’re important. Great example again of working with an institution was at the Wadsworth Atheneum where Eric and I put together with Brandy Culp a fantastic panel of people in contemporary design and decorative arts talking about the through-lines between the two and this was also to honor a loan of a piece that we had commissioned by David Wiseman. This beautiful mirror that goes with the Japanese desk, a kneehole, that we have as well. And the Wadsworth has those two pieces on view right now in a room and it’s beautiful. They’re amazing together and they compliment each other so well. We’ve worked with some really brilliant contemporary designers to create what we hope will be masterpieces and continue to thrive as long as the piece and our collections have. We want to continue to work with institutions and make sure that we loan those though and get them on view. We did a great event with the Metropolitan Museum of Art a few years back. Benjamin Miller: I’ve heard of them. Noah Wunsch: Small institution.No, they’re fantastic. And we do love collaborating with them too. We brought small . . . not actually a small group. We brought about 200 people mostly under the age of 30 to the American Wing to hear Alyce Englund speak about pieces in the wing and of course focus on the John Brown chair which is kind of the the greatest piece in our collection I would say. Benjamin Miller: Could you give me a 30-second overview the John Brown chair? Noah Wunsch: So the John Brown chair is a corner chair and it’s kind of the perfect representation of what a corner chair should be like in form. And I think one of the greatest things that I learned from Alyce actually on that little tour was that the corner show was essentially the La-Z-Boy of its time. That ergonomically and you can see this in its form that it’s really a chair that you use. I can’t say you sink into it because it is still a wooden chair but you can see in the curves of it how the rectilinear quality of it—it’s something that you certainly ease into after dinner it’s kind of you know after you have a big meal you just kind of rest into the corner chair. Benjamin Miller: And it’s not one of the side chairs that forces you to have good posture. Noah Wunsch: No but it was amazing how one little idea completely can change your perspective on a piece of furniture. The idea of an early American piece as a quote unquote La-Z-Boy. I love that. Benjamin Miller: Yeah. Well and it’s relatable. Noah Wunsch: Yes exactly and I don’t think it diminishes the the artistry, the craftsmanship of it because the curves on that piece are so beautiful. But suddenly when you see it that way it shifts because you can see someone just easing into. It does suddenly take on a pose of comfort that isn’t like a corner chair, a side table chair, or a Queen Anne. It isn’t so upright and sturdy and informal. it’s fun. Benjamin Miller: Yeah. So in your personal collecting thing. People collect for a lot of different reasons and sometimes one person may collect for many different reasons at the same time. But the way you describe settling into a chair sinking into it it’s a very personal kind of approach to the object it makes you think of all the people who did settle into that chair in that way over over time when it was first made and since then. Would you say you connect to objects in that way in sort of a personal use level? Noah Wunsch: That’s a great question. On a personal use level I think that my collecting habits have certainly been a little bit more contemporary. So I don’t know that they’ve had the opportunity to have as much historic wear to them. Benjamin Miller: And we’ll get to that in a minute—I want to talk about some of the things that you have collected. Noah Wunsch: I think what I have gained especially from learning from my grandfather’s way of collecting though is doing the background research making sure that anything that I do acquire from a third party has a certificate of authenticity or has the means to get that authentication from an estate. But no I think the thing that draws me in my collecting habits these days is the story of the designer themself. The story of the piece. The thought that went behind it and I think as we briefly mentioned before recording, I like color, I like slashy, like big, bombastic colors. I have a little bit of what I like to call ugly design taste that I enjoy. It makes living with it a lot more fun in my opinion. Benjamin Miller: You are driven aesthetically not just by the stories around pieces. You raise an interesting point when you mention certificates of authenticity. I talk on this show with a lot of dealers and a lot of scholars and specialists and that sort of thing. These are the people writing the certificates. 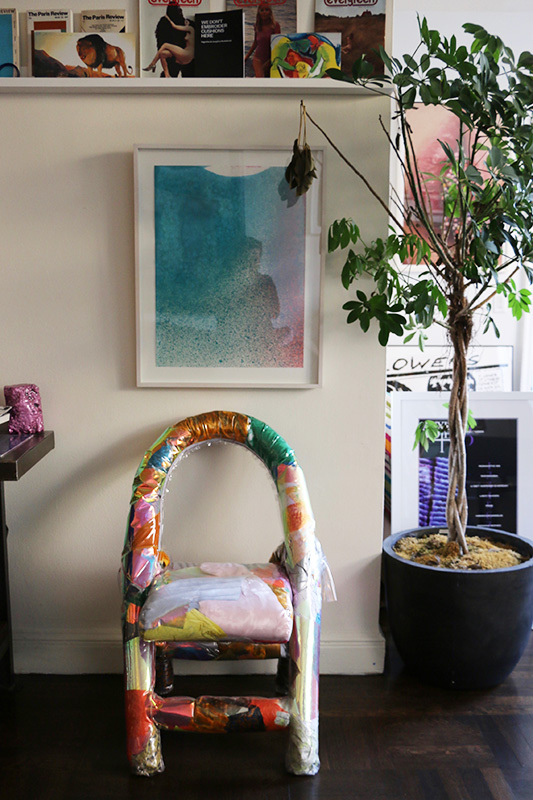 But as someone, as a collector as someone who’s buying across a wide range of different fields because you don’t just own corner chairs for example, What are the sources of or the sort of hallmarks of reliability that you depend on when you’re buying? Noah Wunsch: I think A, you know the major auction houses I do feel pretty strongly that I can trust. If I go with a gallery, and actually the table we’re sitting right now which is Shiro Kuramata’s Kyoto table, I got from a gallery and I hadn’t dealt with the gallery in the past. Luckily the gallerist was wonderful to work with. He was great and he let me be the obnoxious person that I am and try to negotiate him down as much as possible. But the main thing that was important to me was that this was an authentic Kuramata piece. And he said that he had been in touch with the Memphis estate and that they had affirmed that this was the real deal. And I said, Well do you have the certificate? He said no but I can put you in touch with the estate and make sure that they’ll provide you one. And if you look under the table there is in fact a certificate granted from Memphis saying that this is the real deal. So that was important to me because I love this piece and I love Kuramata’s work and I didn’t want to get a reedition. I wanted to make sure that this was made in his lifetime. That was important to me. Benjamin Miller: Why was that? This is a tangent but why was that important to you? Noah Wunsch: Well I think if you are acquiring a piece that’s of value to you whether that is monetary value or sentimental value. In this I don’t have rose-tinted glasses on. I’m not I’m not of the mindset that Shiro Kuramata you know worked with the cement and glass of this piece with his hands. I’m sure was mass-produced in that way. But knowing that maybe he touched something or maybe he had some oversight to confirm that the glass was laid out just the way he wanted it to that it did replicate his vision of minimalism and bombast at the same time. Benjamin Miller: That’s a concept we run across in the world of antique silver all the time. Because of course there are very collectible makers. Everyone seeks these makers whether it’s you know Hester Bateman in England or whether it’s Paul Revere in America. And I think some people are under the illusion that a Paul Revere tablespoon was made by Paul Revere standing at his anvil with his hammer and pounding it out yet. And sometimes I have to disillusion people and say that no, in fact it was a business. And you know some silversmiths were more likely to have done that work than others. But that doesn’t mean that Paul Revere’s silver is any less interesting or valuable. It did pass through his business and it is in a sense his. And so you are in a sense connected to him. Noah Wunsch: Absolutely. I think though what you’re touching on is probably also why we do believe as a family and I think as a field that Americana is so important too, which is that those were not mass-produced, those were touched by the hand of the craftsmen. A John Townsend table is in John Townsend table. And again the thing that always I think that is obvious to us as a field because we know it but usually blows people’s minds when you really are able to articulate it to them is that these were handmade pieces. You look at the perfection of a great Bombay and you see the curves on it. And if you don’t really understand that that’s by hand it doesn’t seem like it’s magic. It can feel like something that a machine just kind of plugged out. But when you get that this was made by a human being and that those curves and the drawers are perfectly placed into them it takes on a whole new quality. I think there’s a little bit of magic there. Benjamin Miller: Well, we’ve been inured to that. Because now we see those kinds of curves in all kinds of mass produced furniture. Of course, it used to be the only way to get that curve was to make it by hand. And that’s why these objects were valuable when they were produced. Not because they were old, they were new, as you said at the start of our conversation. I just had this experience today. I was looking at an auction catalog and I saw a set of four silver candlesticks and it’s a mid-18th century form but they were actually produced by Crichton in the early 20th century. And I paused for a minute when I saw this and I thought when those were first produced and sold by Crichton they were sold to someone who for whom it would have been a real novelty to see a mass-produced object. And Crichton had very skilled craftsman of course but it was a different kind of production and a different scale. But for the first time perhaps a young family might have been able to buy a set of candlesticks of that form. Yeah and okay they’re not as valuable as the 18th century ones. But they look just as nice or close to it and. And prior to that prior to Crichton’s enterprise you just couldn’t have had candlesticks that looked like that. Noah Wunsch: There are these moments where whether it’s part of the industrial revolution or whether it’s a derivative of Moore’s Law where production kind of takes on a new level and it evolves. Seeing an example of that whether we’re starting to see it with artificial intelligence art right now as an example or whether it’s an original Ford which was kind of the height example of a car that was affordable and beautifully produced or whether it’s Prouvé, who the whole mentality behind Prouvé’s work was affordable work that was beautiful and good design for everyone. But now, of course, it’s this rare beautiful object. And what it represents in its simplicity is exceptionalism. So it definitely is fascinating to think about how manufacturing has evolved in the height of the examples. 3D printing will be pretty interesting to see how that starts shaping and if we see real artisans and artists from that. There are great examples already. I mean Joris Laarman has been doing really interesting work with 3D printing too but delineating how you define who is who is the height exceptional representation of this field when it is mass in scale. It’s pretty interesting. Benjamin Miller: So it’s not an area I’m familiar with but in a 3D printing artist is that someone who creates a design in a CAD program and then sends it to you and you print it out? Noah Wunsch: Precisely yeah I think that’s definitely an oversimplification of a really exceptional 3D designer I’d say. But at its base level absolutely. Yet there are a number of programs where you can design these works and you can choose the coloring and formatting and then yeah you can produce it. Benjamin Miller: So let’s step back because I want to know a little bit about the transition that you’ve gone through. Well I don’t know if a transition is the right word for it but you grew up in a family with a keen interest in old American decorative arts. You now collect other things you collect modern and contemporary works. What is it that you needed to learn as you moved into the world of modern and contemporary? Noah Wunsch: I think more than anything the one thing I need to learn which has stayed true from the beginning was something my father taught me really, and probably my mom too as their example of this which is no matter what you’re buying make sure you like it. Benjamin Miller: Easier said than done. Noah Wunsch: 100 percent. We had what I would call probably the ugliest painting I’ve ever seen in my entire life growing up in our apartment in New York City when I was a little kid. And the story behind it is that you know my mom and dad were keyed in that this was an up and coming artist that he was really he was a great investment. And of course the artist didn’t go anywhere. And we were stuck with this horrible memory of a bad investment that we were too stubborn to take down. So living with that god awful piece I’m sorry mom and dad was a great example of no matter what comes first is make sure that that you really love this piece and that you want to live with and that it has a live ability that goes with your life. Benjamin Miller: And then if it’s not worth anything to anybody else it’s still worth something to you. Noah Wunsch: And I think that while I certainly live with modern contemporary. I live with early American. I have two 19th century glass portraits on my wall which are right below some Genieve Figgis paintings, and Genieve Figgis is a contemporary artist that I love. I have some outsider art, I’ve got a Thornton Dial right when you walk in. And a lot of that I mean I didn’t know anything about Thornton Dial until I saw that work and then I was fortunate to have some people give me some books and say if you’re interested in this field you should really read up on folk art outsider art and art brut. And before I acquired any Thornton Dial I made sure that I read up and I understood the field better so that I wasn’t just only reacting on instinct so that I understood where this was coming from, the field at large. So I try to do that if something is interesting to me visually that’s usually a step one. Step two is then learning and then step three based on the learning is potentially acquiring or learning more. Benjamin Miller: What do you think about if you read old books on collecting old guides to collecting across different fields of antiques. What you’ll often see by way of advice is people saying well the first thing you should do is decide what your area is you should decide you know do you want antique maps of Italy. From the 17th century or do you want 19th century Austrian watercolors. And so the idea is or you know do you want American coins. The idea is define your area and then try to get the best things that you can. Yes within that area. But you’re setting a larger stage for yourself. Noah Wunsch: I hope so. I can’t speak at large because I think certain collectors collect certain ways. For me I think living with different categories learning about different fields speaks to my interests. It speaks to how I want to live. I would love to have the greatest representation of Austrian watercolors but I don’t see why I can’t have that and dip my toes in contemporary art as well. And I think it’s reflective of how people live today. And I think it should be encouraged. I think it’s important also for antiques for early American as well to show the diversity and the ability to live in a modern contemporary setting with these pieces too because so often to your point you see period settings where you see these unbelievably ornate beautiful rooms. But they can feel dated. They sometimes don’t feel contemporary. And I don’t know that it’s the best example to younger people that that this is still a vibrant field. Benjamin Miller: Right, it feels like you have to consign yourself to living in a museum. Tell me about this. Because different people as we’ve touched on collect in different ways but they also enjoy their collections in different ways. Some people try to create the most consistent and period appropriate and wonderfully beautiful rooms and then they throw a party and they invite everybody over and enjoy the setting together. And that can be a wonderfully exciting thing to do. Other people collect a few things and put them in a china hutch and take them out once a year to look at them. How do you enjoy the things that you’ve collected? Do you enjoy them by yourself or socially? Or do you enjoy them academically? Noah Wunsch: Mix and match. I think right or wrong, because my brother and I have gone deeper in the design field and learn more about it. What’s been really interesting to me is that my friends ask me for recommendations now. And it comes from a place of being uninformed I think in some cases that they want to learn about it but they don’t know the access points yet they don’t know where to begin collecting. So I would say if I were to say that my collecting habits are social it would be in hopefully trying to open up different fields for friends and colleagues and younger people as well. I certainly like having people over. But I don’t I don’t do the kind of parade thing where I go and if you look at this piece right here it’s you know it’s a wonderful photograph and if people ask me questions about certain pieces I’ll definitely tell them. But I like I like living with these pieces. I think that was the example again that our grandfather set for Eric and I, too, which is he lived with all of his pieces. He sat in the John Brown chair every single Thanksgiving he wasn’t precious about his items. He recognized the utilitarian quality of them as well. You know going back to the table where we’re sitting at right now. We were having drinks on this table right now. Benjamin Miller: I just dropped your coaster on the floor. Noah Wunsch: That’s totally fine. We picked it up and you know scuffed it off. It’s no big deal. I think you should derive pleasure from the things you live with but you shouldn’t you shouldn’t be tiptoeing around that. This is this is your life this is your home. I like sitting in these chairs and at this table. Benjamin Miller: Do your tastes differ from that of the rest of your family? Benjamin Miller: Typical older brother. Benjamin Miller: You just proudly called it ugly a minute ago. Noah Wunsch: Yeah. To some people not to me. To me I love it. I like living with color. It’s fun for me. It’s certainly again I think that adds to the quality too of not being scared to sit in and enjoy these things to you. I think if everything was white and original Florence Knoll who I love by the way but if it was all white I would probably have a I would probably be tiptoeing around my part. Yeah. The fact that everything is colorful I can be a little more dangerous with it. Benjamin Miller: All right well let’s get a look at some stuff right. Noah Wunsch: Alright, let’s do it. Benjamin Miller: Noah was kind enough to take me on a tour of his collection, which is to say, his apartment. We’ll jump into that momentarily, but first let’s hear from our sponsor. Would you like to learn how much the most expensive American looking glass ever sold at auction went for, or to find out if your collection is appropriate for sale? Freeman’s, America’s oldest auction house, has the answers. Discover how Thomas Eakins’ Gross Clinic stayed in Philadelphia, delve into the work of Wayne Thiebaud, the great draftsman, and much more on their website, freemansauction.com. From modern masters to French furniture, Freeman’s takes you behind the scenes at auctions and exhibitions, delivering the latest in art market news, events, and stories. Subscribe to their biweekly magazine and get it sent straight to your inbox. Visit Freeman’s at freemansauction.com to learn more. I always like to take just a minute to say thank you for listening to Curious Objects. I especially want to thank those of you who have written to me with your feedback, which you can do over email at podcast@themagazineantiques.com. I love hearing from you, and I also love reading the reviews you leave on iTunes. Every rating and review helps spread the word, and it’s kind of you to take a minute to do that. So thank you very much, and now let’s get back to Noah Wunsch. Well it’s your apartment. Where do you want to start when you want to concentrate on here? Noah Wunsch: Where should we start, Indie? Benjamin Miller: We should start with Indiana Jones. Noah Wunsch: There we go. We’ll I’ve collected a dog. She’s a bit of a mutt. Benjamin Miller: Looking around, it was hard to say which pieces were functional and which were decorative—in fact, plenty of Noah’s objects are both at the same time. We stopped to look at a small decorated copper square. Noah Wunsch: Over here you’ve got ancient-seeming belt clip. When I moved into this apartment and this is yeah this is from 60 BC which is always fun. 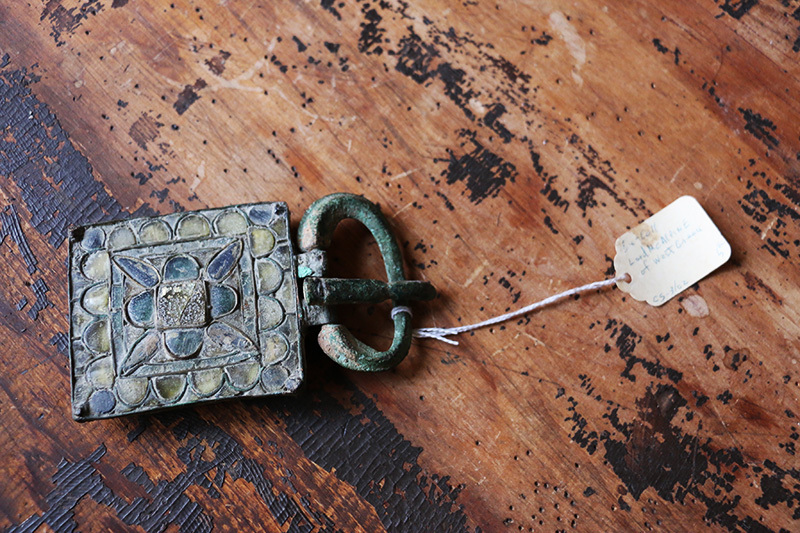 It’s a Visigothic buckle. Pardon me. Benjamin Miller: So when they took a break from sacking Rome then they just set up belt buckles. 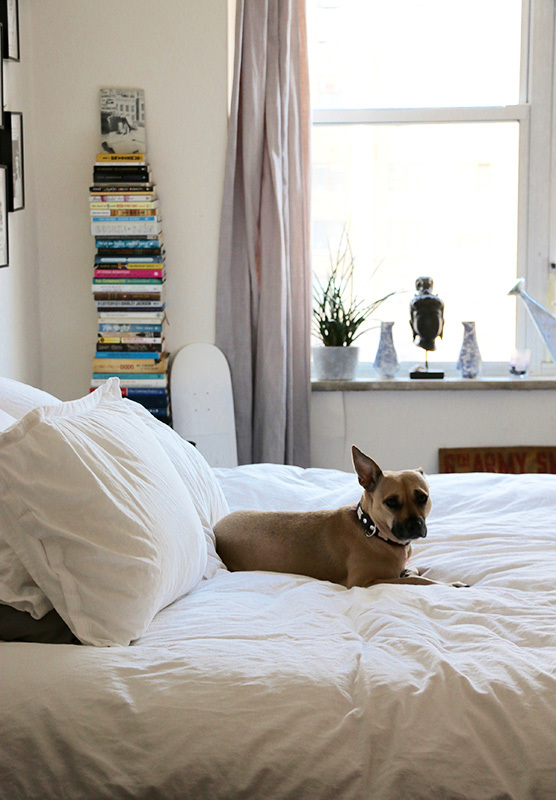 Noah Wunsch: This apartment kind of used to be a storage facility in many ways from my grandpa just for all the weird random things he collected. So every now and then I’ll just kind of open a closet and feel around and find a Visigothic belt buckle. But when I first moved in he had ancient glass all over the apartment. I mean on the floor which was great I mean works from 500 BC. Which they should not have been, and a part of the fun part of moving in here to was starting to organize his collection a little bit to make sure that they weren’t on the floor but learning as the process went along. Benjamin Miller: It’s like walking through the storeroom of a museum. 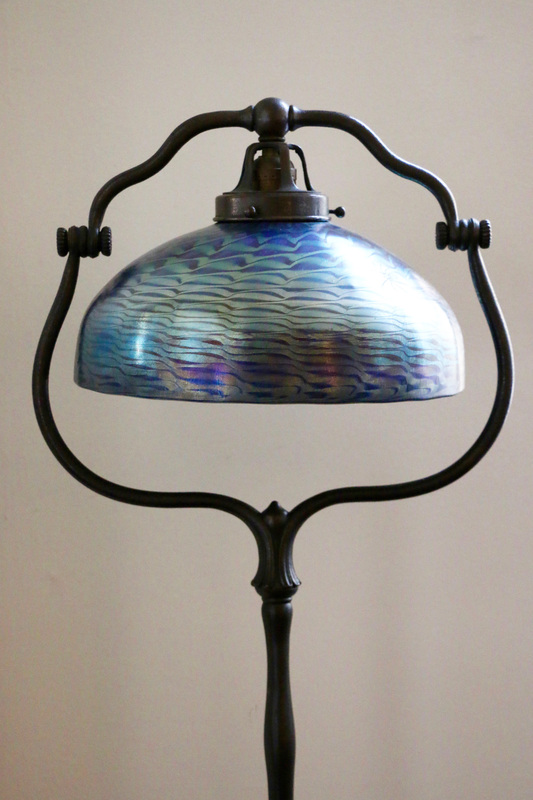 The first piece that had caught my eye when I first walked into Noah’s apartment was a floor lamp with a beautiful glass shade in a hatched azure pattern. It’s on a tall patinated stand with three cabriole legs and a just-so Art Nouveau look. Benjamin Miller: You don’t really notice it across the room if I step back a few feet. Yes. I barely see it. Noah Wunsch: It took me years to notice it and I remember the day I did my mind just kind of exploded because it was just this little hidden secret I think in fact I had the reaction that I was probably supposed to have which is I thought there was a gigantic spider underneath the shade. Yeah but there’s something so playful about it but I think also spoke to kind of who my grandma was. So it’s a special piece for me and I love it. Benjamin Miller: Do you think she bought it because she felt it reflected who she was? Noah Wunsch: I think she liked Tiffany but I think she had a good sense of humor. So I definitely think there was there was an aspect of that spider I think that she knew. Noah Wunsch: And the legs. Benjamin Miller: Yeah that is sort of a Dr. Seuss quality to it. Noah Wunsch: Absolutely. It kind of jumps off the ground like a spider. You know over here I was trying to do some more research on this sword, I was telling you this is a mystery to all of us. We don’t know the background. But the wonderful thing about this sword I remember growing up my brother and I would go to visit our grandparents and our grandpa would hand us I kid you not this sword in another sword to give me and my brother the opportunity to have a literal sword fight OK.
Benjamin Miller: And for the sake of listeners I mean this is a sword. Noah Wunsch: So yeah it’s from the 1790s it doesn’t have the cork tip on it that it had when my brother and I were fighting but again just to keep in mind it was just a cork on the tip of the blade. This could have done serious damage. Noah Wunsch: No shockingly. No. I think it was probably too heavy for my tiny little arms to swing around. Yeah. This is this is just a piece. Benjamin Miller: I mean that was a literal fantasy of mine when I was that age. Noah Wunsch: I hate to rub this in: I got to live your fantasy. And then these glass blown canes which are underneath that. Benjamin Miller: Next we looked at a pair of long glass tubes, decorated with colorful spirals and with a bulb at one end. I don’t know who the maker is on these but again these were ones that I would always see growing up. I always thought they were priceless. I don’t know. There’s a level of fantasy to them that I think probably speaks to also why I collect such weird things too. That there’s a little bit of magic in things. Benjamin Miller: Well it’s nice to have a personal nostalgia associated with things. Noah Wunsch: This one over here too it just looks and feels a bit like a staff. Benjamin Miller: I could see I could see Gandalf using that. Noah Wunsch: Here. We’re not dainty with our things. Enjoy. Benjamin Miller: Fabulous. That’s lovely. Here you’ve just finished telling me about how you don’t invite people over and lecture them. Noah Wunsch: I know! You asked! Benjamin Miller: That’s why I came here. Noah Wunsch: So these two paintings which are these glass portraits from the 19th century. Benjamin Miller: We had a look at two small images hanging on Noah’s wall—both reverse paintings on glass, which is an old technique where paint is applied to the back of a plate of glass, then viewed from the front. The effect is saturated colors with high contrast, and in this case, portraits of a very distinguished looking man and woman. Benjamin Miller: I have to go sell something worth real money for money. Noah Wunsch: Yep, real money. Benjamin Miller: Who’s the fellow in the photo? Noah Wunsch: That’s my grandfather. Ah so that was him on his 70th birthday wearing an ascot and I think that’s the only time I’ve ever seen him in an ascot. The man can pull an ascot off. And then this little medicine cabinet I like actually what’s inside more than the medicine cabinet. Benjamin Miller: So what’s inside it? Noah Wunsch: Just playing cards. The company that the family started way back when called Silent Hoist which was again an industrial engineers company, created these cards every holiday for people who worked at the company. Benjamin Miller: Are they the kinds of cards that are worthless if they’re not in their original packaging? Benjamin Miller: Absolutely. It’s not everyone who can collect antiques that have a proper family history. Noah Wunsch: That’s the problem with using a medicine cabinet from the 1800s. Benjamin Miller: The drawers are sticky. What about the magazines? Noah Wunsch: When I was about 18 years old. I was working for magazines all over New York City. I was writing for them. I was the editor of a few. And then I transitioned onto the business development side. But I had a real love for print magazines especially older magazines and kind of the time capsule they represented too. Old Interview magazines I think are just some of the greatest. Works ever. And you don’t see magazine covers like that anymore. I got this Brian Bosworth one and it’s certainly a celebrity profile photo but the artistic quality is beautiful. It’s a work of art all its own. I had to pull out an Abercrombie & Fitch quarterly magazine because for anyone who grew up during the 90s the time capsule that represents is just above and beyond. Benjamin Miller: That is a blast from the past. Noah Wunsch: It’s crazy when you see the nostalgia quality but also the ability to transport yourself suddenly by going through the pages. It’s eerie and it’s amazing. And then there are these magazines from the 80s called Wet magazine that was about bath culture. I kid you not. Like high end luxury baths. Her whole mentality behind it. It was pretty much a punk magazine. It was this guy out at the West Coast who wanted to start a magazine. And he’s like everything else has been done. So I’ll start a magazine called Wet magazine about bath culture. So I have magazines probably ranging back from the 1950s through today and that’s transitioned into a love for books now, too. Benjamin Miller: A familiar book cover caught my eye—it was Holden Caulfield in his trademark red hunting cap, but here he’s wearing it backwards and has a rather dandy scarf around his neck. What’s the Catcher in the Rye edition? Noah Wunsch: This is an interesting one. I was surprised because I got this for a whisper at Mast Books. There were very few editions of The Catcher in the Rye that actually had an image of Holden Caulfield on the front cover. Salinger was adamant that no one should see or understand what Holden looked like. Benjamin Miller: Right. So this is heresy actually. Noah Wunsch: There are a few releases of magazines that actually did feature him with his red hunting cap on the cover. And this was one of them and I was lucky that I could just kind of snag it for a whisper but it was just one of those weird little things I spotted and immediately called out to me. Noah Wunsch: And then over here I’ve got another edition from the American Book Club from the 1960s. That’s another harder one to find of The Catcher in the Rye. Obviously I love The Catcher in the Rye. There’s no surprise there. Benjamin Miller: Why. Why should that be no surprise? Noah Wunsch: I mean I can imagine everyone loves The Catcher in the Rye for the most part. Benjamin Miller: You’re not saying you identify with Holden? Noah Wunsch: No of course not. There’s a special place in my heart. But the little details to just kind of illustrated qualities. How the 16 that number kind of swoops to the right. That’s not in the actual edition. Just having these special qualities of them. And I also love the space because everyone is familiar obviously with the usual printing of The Catcher in the Rye and it’s kind of like almost a little chapbook and it feels very condensed. So to have it almost kind of luxuriate on this much white paper. It’s almost as if the story’s expanding too. Benjamin Miller: It certainly feels like a serious volume. Noah Wunsch: Yeah it’s not. Well let’s see. You got the federal bookcase. And this is probably the best example of actually living with a period piece, too. And then of course the case frame above it—18th century—and the portraits as well. Again contemporary living with period is really interesting. There’s something about this case piece that just fits in I think really anywhere. I think it could live on its own. I think it could live in a period room and not feel out of place, it could live in a contemporary setting and not be out of place. You carved lions on the side of it. I mean it’s it’s a really beautiful piece of craftsmanship. Noah Wunsch: Yes definitely bold and so is the gigantic frame above it. Benjamin Miller: Which I will note is empty. Noah Wunsch: Yes I like the empty space which is surprising considering how full this place actually is. And then over here you know this is probably one of my favorite pieces here which is a Robert Mapplethorpe photograph I got from this great gallery on the West Coast called Morán Morán and they represent the Mapplethorpe estate. And this is this one called The Rockcats that was you know some gang members one gang member in particular obviously for this photo that Mapplethorpe photographed. And I just love the swoop of his hair. It just has such an essence of cool about it. Benjamin Miller: It is so cool. And classic Mapplethorpe. Benjamin Miller: All right. Well we’ve done a pretty good tour. What’s the story with these chairs? 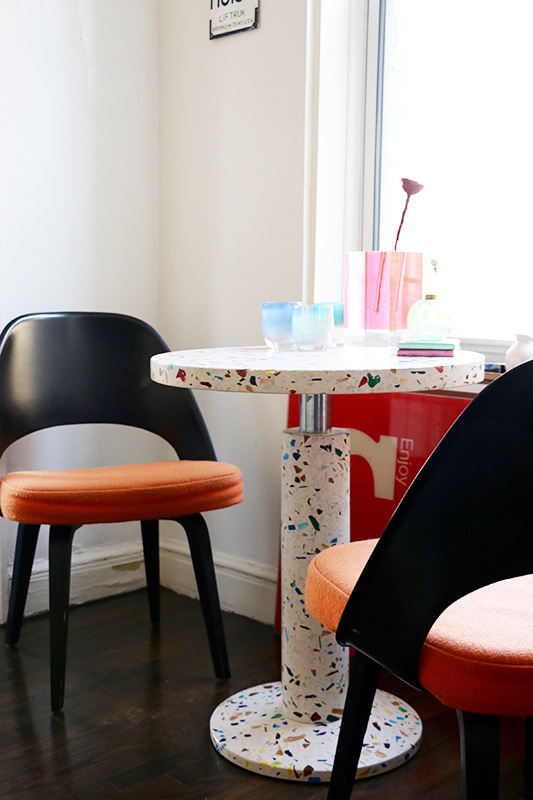 We’re looking at a pair of almost cartoon-like chairs that look like someone’s very colorful laundry stuffed into a plastic frame. Noah Wunsch: They’re by a designer named Katie Stout who’s represented by R & Company and Nina Johnson gallery. It’s funny, she graduated from RISD alongside another great designer named Misha Khan who’s represented by Friedman Benda. And I think Misha I know actually Misha had these chairs in his apartment for a bit. And there was an editorial cover of his apartment. And I remember reaching out to Misha, saying Misha I love your chairs like I need can I buy your chairs. He’s like I didn’t design those. Those are Katie. So I immediately out to Katie and asked if if they were available. So I bought Misha’s chairs designed by Katie. But again I just think they’re so much fun and they’re actually extremely comfortable. Benjamin Miller: Are they really? Benjamin Miller: Once again I’ve got to give this a try. Oh, you’re right! Noah Wunsch: It’s like sitting in a stuffed animal. I mean it’s wonderful. Benjamin Miller: Yeah but you wouldn’t necessarily think to look at them. But. Yeah I would take this over a corner chair any day. Noah Wunsch: Very cozy. The La-Z-Boy of its time. Benjamin Miller: This whole living with antiques thing seems like a little bit of fun, doesn’t it? I hope you all enjoyed it. That wraps up our tour of Noah Wunsch’s world of wonders. Thanks so much to Noah for talking with me and sharing your home. Keep in mind, you can see pictures at themagazineantiques.com or on my Instagram @objectiveinterest. And send me your thoughts and comments at podcast@themagazineantiques.com. Catch us again next month! Today’s episode was edited and produced by Sammy Dalati, our music is by Trap Rabbit, and I’m Ben Miller. 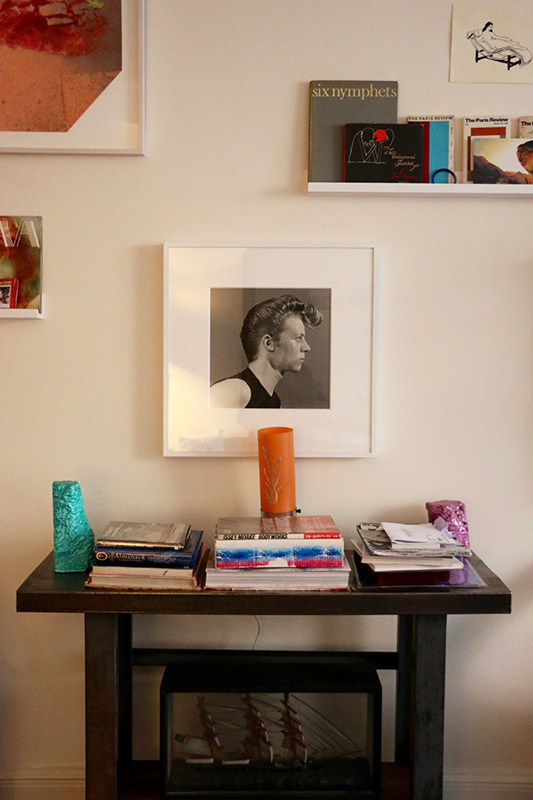 The Rockcats by Robert Mapplethorpe, 1980, installed in Noah’s living room. Stuffed chair by Katie Stout, 2017. 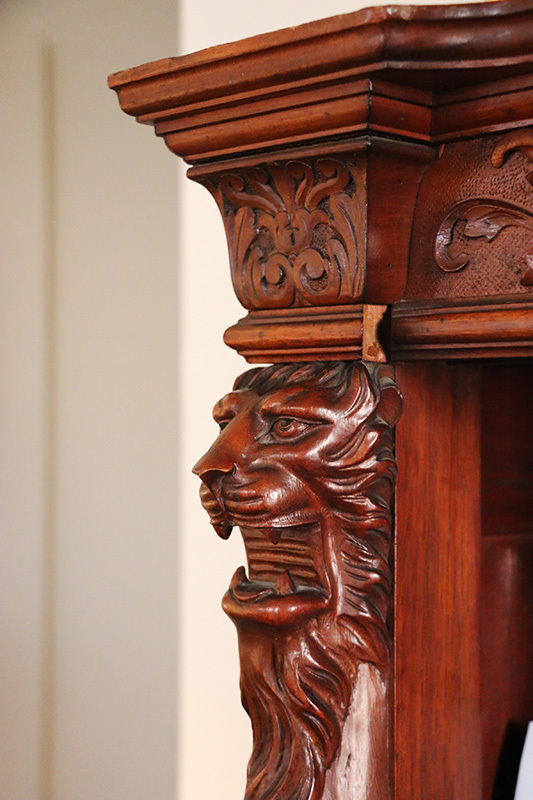 Federal bookcase with lion-head finials and 1700s frame. Detail of the lion-head finials. 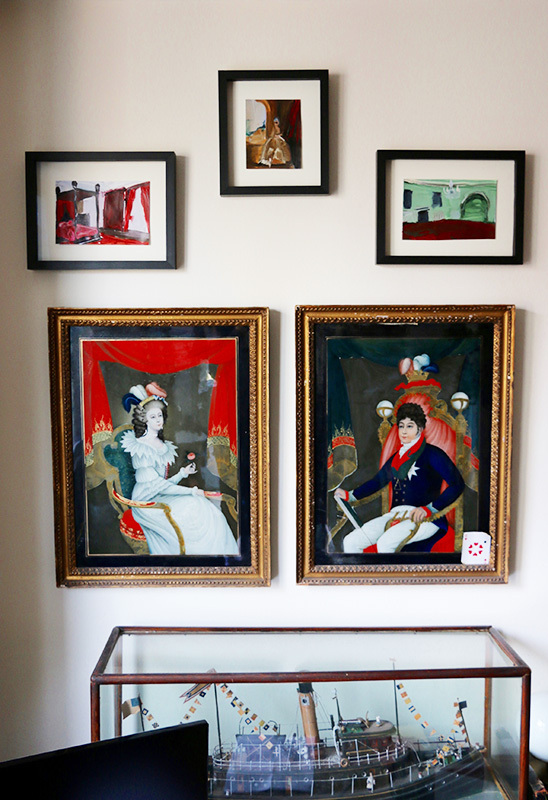 Three Genieve Figgis paintings above two glass portraits, 1800s. 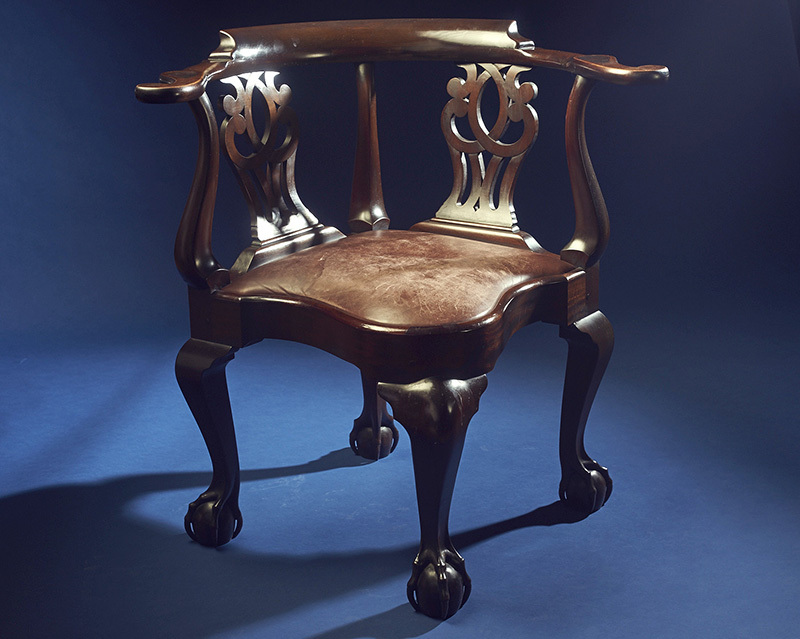 Carved mahogany corner chair by John Goddard for John Brown, Newport, 1760. Wunsch Collection, on loan to the Metropolitan Museum of Art; photograph by Jai Lennard. E. Martin Wunsch, Noah’s grandfather. Visigothic belt buckle, 60 BC. Detail of a Tiffany Studios floor lamp. 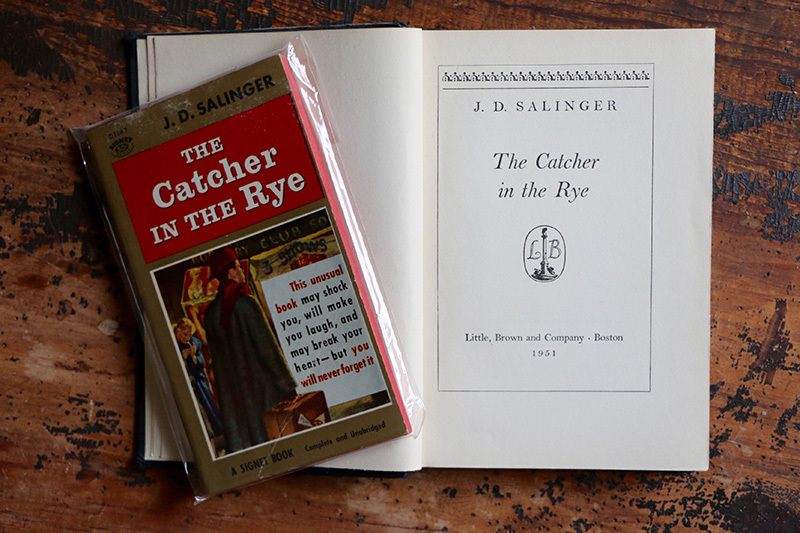 Signet and Little, Brown and Company editions of J. D. Salinger’s The Catcher in the Rye. 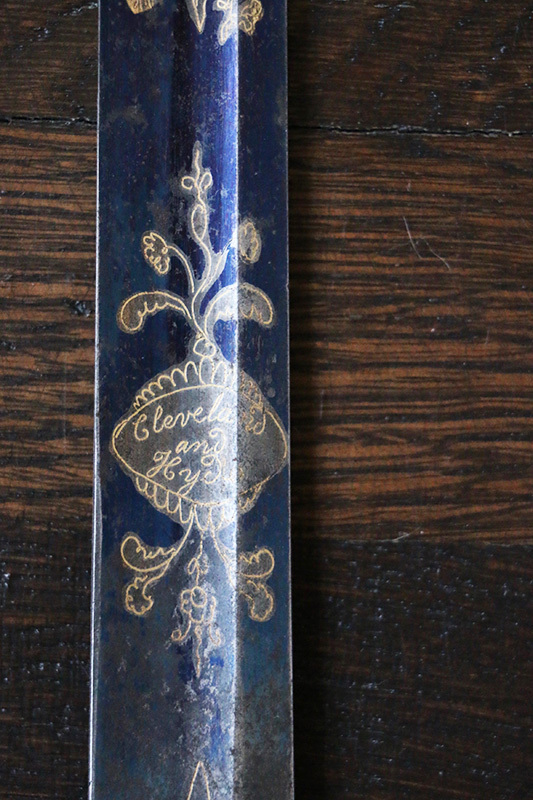 Detail of a 1790s sword with eagle head pommel. Noah Wunsch is the Senior Vice President, Global Head of eCommerce at Sotheby's. Noah also manages The Wunsch Americana Foundation along with his father, Peter, and his brother, Eric. The foundation was started in 1946 by Noah's grandfather Eric Martin Wunsch.